Hope your new year has been off to an amazing start. I ended last year on amazing note and starting this one the same. Just wanted to share some more good news with you guys. 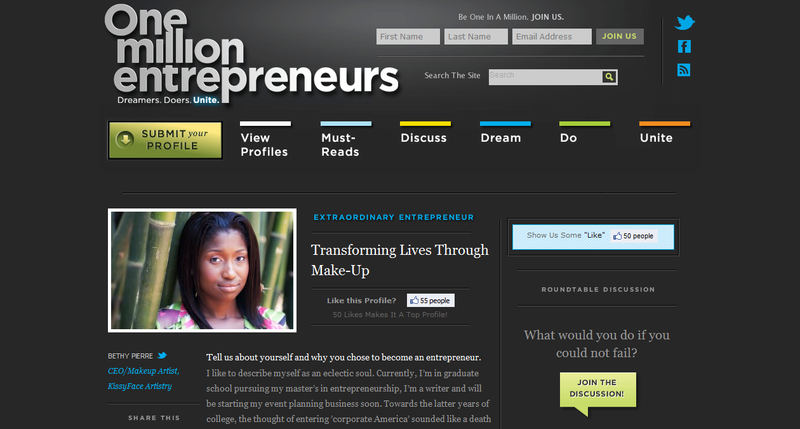 The latter end of 2010, I was featured on Jaye Magazine and now I'm featured here on One Million Entrepreneurs. I entered my profile to the site on a whim but when I got the email stating that I had been chosen to be showcased it made my day. Too often I let doubt enter my mind and stop me from attaining what God has already opened the door for me to do. I just need to walk in faith that this is for me. This stop and go attempts at pushing for KissyFace is such weak and undisciplined attempt doesn't allow things to fully develop. I can't expect thing to move if I'm standing still. I need to get be consistent and work on that much harder to make things happen. I can't expect things to just fall in my lap, which admittedly I have been doing. It doesn't work that way. I've got to work hard to get what I desire-- point blank. I've made commitments in the past, to get things going but having experienced certain things recently, and being aware of the greatness that is open for KissyFace Artistry, it deserves a fair fighting chance. I've realized that the same faith that others have in me, I need to have it within myself. I look forward to interacting more, sleepless nights and just working to make things truly come true.